What are large-scale organizations doing for robust ERP Testing? ERP systems contribute substantially in boosting the productivity and growth of an organization. 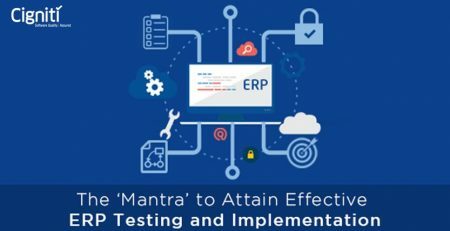 Hence, ERP Testing is of major significance for enterprises to ensure that the system syncs in well with all the functions. ERP solutions are implemented for multiple tasks, namely, inventory tracking, management of finances, tracking customer transactions, human resources, and much more. In fact, in the current scenario, ERP vendors are even encouraging the use of augmented reality and application of Artificial Intelligence to manage the massive processing of data. It has been inferred that in some cases effective implementation of ERP solutions has boosted employee productivity. Ultimately, the solutions are built to save time, efforts, and streamline the activities that help to bring operational excellence for organizations. New technologies such as AI, Augmented Reality, and Virtual Reality can further support and empower ERP solutions to bring enhanced value for organizations. ERP Testing for Large-scale organizations. What does it take? Though ERP solutions are being implemented by organizations of all shapes and sizes, implementing these solutions for large scale set-ups can be tactical. Organizations need ERP solutions to manage the business set-up under one system, stay updated, streamline processes, ensure effective business data analysis, and ultimately, meet customer expectations. On the whole, ERP solutions help to preserve and stabilize an organization’s work structure to make it deliver and perform better. Let’s look at how large scale organizations are effectively executing their ERP Testing strategy. Choosing the ERP solution is a strategic decision that you need to make with thorough scrutiny and research. But, make it a point to define your end goals and business objectives before you take a call. This makes sense even for building a relevant ERP Testing strategy. Defining ‘what to expect’ sets everything in order and creates a result-oriented testing pattern. Large-scale organizations take a step-by-step approach by involving numerous functional departments. At the same time, it is critical for organizations to understand the processes and the general business while choosing the right ERP solution as well as setting up the testing strategy. That way, you are able to prioritize the processes that need specific attention, which might also include long-term or short-term goals. Any tool or solution adopted has to ensure performance. Hence, it is important to quantify your performance metrics and your RoI before starting the ERP implementation and testing activities. In some cases, organizations can even build a strong business case for the ERP software to define the KPIs and evaluate how they will impact the RoI. Practically, it makes total sense to establish the key Performance Metrics to derive definite ROI. Involving everyone might be an easier task in a smaller set-up, but it is a much difficult process in a larger organizational structure. 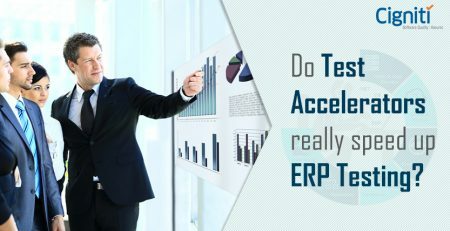 It’s all the more critical for large organizations to ensure that all the functions are involved in the ERP adoption and implementation phase. The involvement process also includes necessary investment in training for all. It can ensure better RoI from the solution even in the longer run. Data is a critical component in any organization. Data that is collated over the years from various departments can truly empower an organization to plan strategic moves. Hence, during ERP implementation and testing it is important to figure out your data migration process and path. In fact, data migration must be the first thing on your chart to ensure any data loss or chaos towards the end. At the same time, it is important to prioritize your business critical data zones, enabling you to smoothen the migration process. This prioritization has to begin way ahead in the implementation cycle. Business Intelligence is being actively adopted by enterprises in the recent years. BI insights can provide a great deal of value when applied on the data derived from your organization. The data can provide business critical opportunities, market trends, consumer insights that can help enterprises to plan their next move. It has been estimated that about 53% of companies are adopting big data and analytics to build data-driven strategies for their business. Hence, it is recommended to apply BI and Analytics to transform your ERP data into meaningful insights that bring business value. A leading provider of Online Legal Services hired Cigniti for specialized ERP Testing & Test Automation. The Client was a leading provider of online legal services to more than 300,000 small businesses and 75 percent of the Fortune 1000. Cigniti team with its expertise in Test Automation and ERP testing hired JDE E1 Consultants to reduce Knowledge Transfer (KT) burden on client team. They performed proper triage of defects – identified the defects, assessed the criticality of the defect, and performed root cause. In the process, they even implemented Automation Testing of Regression Suite. Cigniti’s ERP CoE suite has a repository of customized pre-built test accelerators for 3000+ manual test cases, 2000+ automated test scripts, well-defined test data management processes, and robust test automation frameworks for leading ERP platforms. Connect with us to leverage our expertise and experience in ERP Testing. 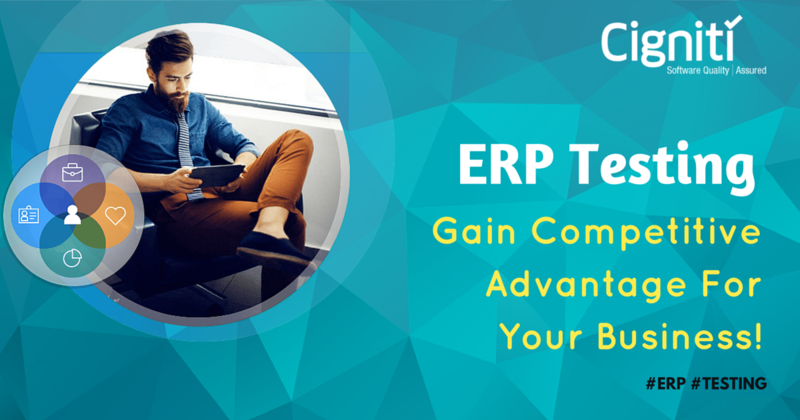 ERP Testing: Gain Competitive Advantage For Your Business!